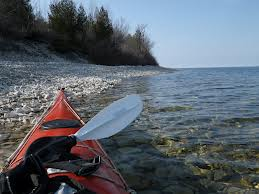 There has been a lot of news coverage this week of the kayak rescue here in our beautiful Door County WI. Lake Michigan is a force unto herself, and one I watch closely. After living along the shores of Lake Superior, I have a deep respect for these lakes and their power. The clear, cold waters of that lake insisted on respect; the waves pound in the winds and a person would not last long in the chilly waters. I so loved that powerful lake, and continue to seek her mysteries that she whispers with each lap of her waves. Such raw nature is a spritual treasure and deep inner knowing comes with each encounter. Now that we are back in Wisconsin, along the lake that I knew from birth, I feel this same reasonance. A different power, perhaps not as fierce, but more veiled. Lake Michigan entices water sports, beckons us to explore her territories. Yet she is fickle and will change in a heartbeat, and we must not forget this changeable nature as we tour. I love the water; I love the sounds, smells, sensations of the shoreline. I love being out on the water, the unique vision of rugged terrain from the water. But only when I know I am prepared and with others of experience. I smile as I realize my surrender to a power much greater than I. This entry was posted in Spirituality and tagged deep inner knowing, Lake Superior, mysteries, power, reasonance, respet, spritual treasure on July 15, 2014 by Marggie Hatala. thanks for your beautiful words, once again, Marggie. This time, they brought back awesome memories for me – Chuck and I lived in southern Ca. for a time after we were newly married. We had a sailboat and called it our 2nd home. Oh, the smell of the water, the camaraderie of others in the marina, and the Pacific Ocean creatures . . . one of the best times of our life. Followed, I am happy to say, by so many more happy times. Blessings to you.